In this third part of harmonic mixing, Dubspot instructor and contributor to the ‘Mixed in Key’ algorithm, DJ Endo examines the accuracy of detecting the correct musical key using Mixed In Key. Mixed In Key is changing the face of the DJ world as we know it. By analyzing your digital music files, Mixed In Key can detect the musical key of each one of your songs. It even writes the song’s musical key directly into the audio file so you can view the musical keys in programs such as iTunes, Traktor, Ableton Live, Serato, and more. This indispensable software allows DJs to sort their playlists by key so they can quickly find tracks that are in harmony with each other. This affordable software can save you a lifetime of sitting in your DJ room with a piano writing all the keys on your record sleeves. You literally run your music collection overnight and the next day you are reborn as a harmonic mixing DJ that will never turn back! While all of this is a dream come true for some, a lot of people argue about how accurate Mixed In Key really is. There have been studies out there comparing Mixed In Key’s results with musical databases, but the studies were mostly done for Rock, Alternative, Pop, and Top 40 songs. 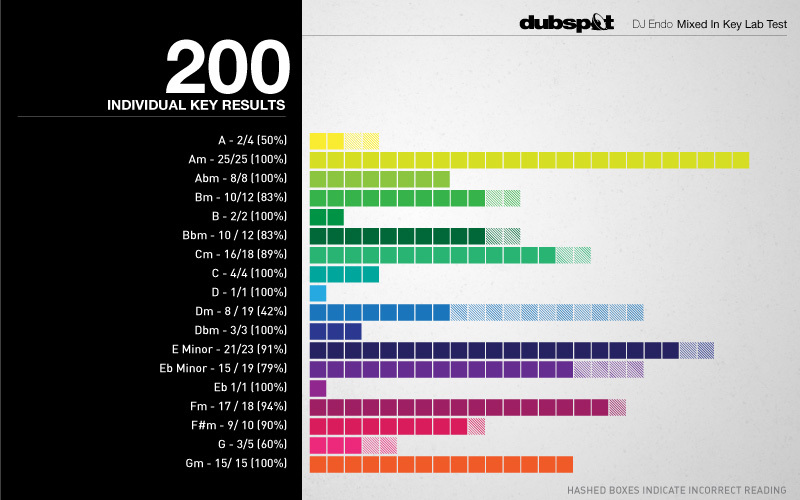 What I wanted to see was how accurate Mixed In Key was for Dance Music. I took 200 of my best House, Tech House, Techno, Progressive House, and Breaks tracks, and keyed them all one-by-one manually on a piano. I made a spreadsheet that compared all of my results with Mixed In Keys results. I was able to gather some very interesting data about how accurate the program really is for the music I play. I double-checked all of the tracks to make sure my results were completely accurate by comparing the Mixed In Key’s results with my results from using the piano to figure out the key. I also looked up each tracks genre on Beatport just for fun, and to get genre specific data. After collecting all the data from 200 Dance Music tracks, I discovered the following interesting facts. 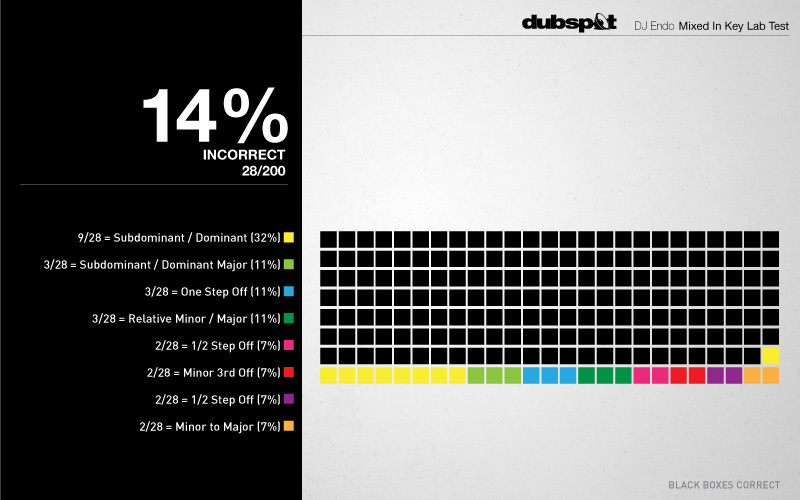 Mixed In Key is 86% Accurate for Dance Music. Genre-wise, I found that it correctly guessed 85% of my House, Progressive House, and Tech House. 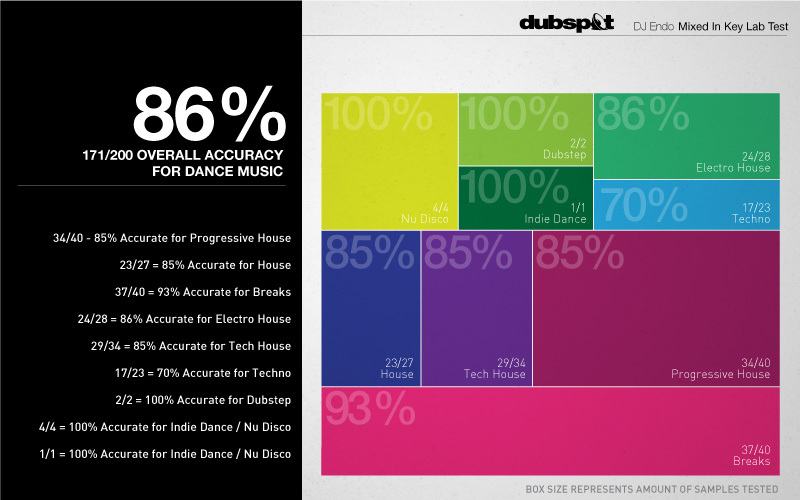 Electro House was 86% accurate. It was most accurate for Breaks which were 93% correct. Techno was least accurate out of all of the genres and was 70% accurate. I was actually expecting a lot less than this based on an old test I did with an older version of Mixed In Key, which was 37% accurate for Techno. Big improvement! Mixed In Key incorrectly guessed the keys of 14% of my tracks. However, I found that out of the tracks that were incorrectly guessed, 59% of those tracks were guessed to be in harmonically compatible keys. Out of the tracks that were incorrectly guessed by Mixed In Key, 32% were guessed to be in a subdominant or dominant key, which are harmonically compatible with each other. For example, 5A or C minor was analyzed in M.I.K. as 6A or G minor. 11% of the tracks incorrectly analyzed by Mixed In Key were guessed to be in relative minor/major keys, subdominant/dominant major or minor keys, which are also harmonically compatible. 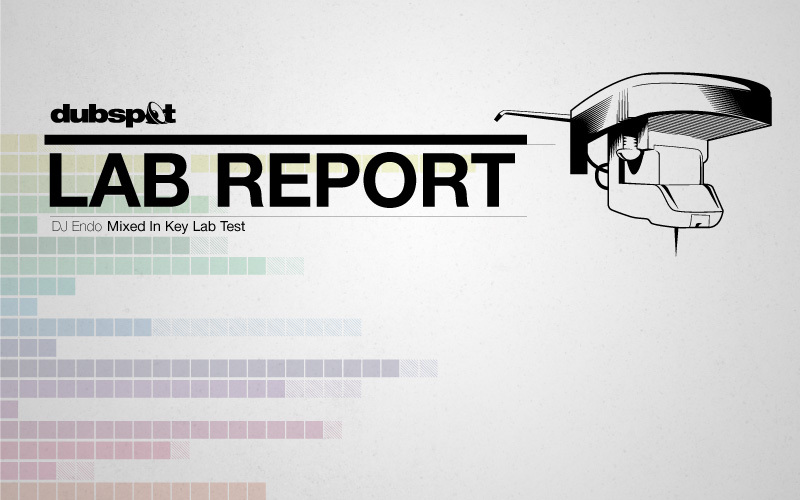 I found that the program was just as accurate for major and minor keys based on my results. 88% of the tracks in major keys were guessed correctly while 87% of the tracks in minor keys were guessed correctly. I also found that Mixed In Key correctly analyzed 100% of all of my tracks in A minor! It guessed 25 out of 25 of my tracks in A minor correctly. These results are great news because A minor is the most popular key in my music collection. Below is a mix I did entirely in the Key of A minor. Mixed In Key also correctly analyzed every track that was in G minor, which is my third most popular key. I’ve found G minor to be a very funky key. Below is a mix I did entirely in the key of G minor. The only key I noticed that was incorrectly guessed a lot was D minor. Out of the 19 tracks in my study that were in D minor, only 8 were guessed correctly (42%). Even so, when I add up all the results from the most popular keys that I play in, about 93% of the tracks in those keys were correctly guessed in Mixed In Key. Below is a mix I did in the key of F# minor. As you can see by these results, Mixed In Key is a serious tool for DJ’s looking to improve their musicality and is very accurate when analyzing the keys. If you don’t have Mixed In Key yet, you better get it soon, or you will get left in the dust! It will change your DJ life forever. In case you missed it, check out the other tutorials of DJ Endo’s series on harmonic mixing. First, thanks so much for this series! I’ve been using MIK since reading the first two articles and it’s been a great boost to the “playfulness” of my DJing. Second, those are rad infographs. How did you make them? yo was def looking at buying this and was def leaning towards the yes. simple just for an outside the box perspective (and more time effective way of keying tracks lol). Many many thanks for this. I have been relying on deaf faith for a while so your thorough analysis of MIK is music to my ears. In your opinion do you think sets sound better if you stick to one key or a very tight range at least or if you move around a lot with compatible keys? A free alternative to MIK is Rapid Evolution (www.mixshare.com), which has been shown in the past to be more accurate than MIK (I’m not sure about recent versions, as both sides have evolved). The major complaint with Rapid Evolution 2 was its complexity and ease of use. Rapid Evolution 3 is now in open beta which offers a new simplified experience–i.e. it can automatically detect the BPM, Key, Beat Intensity and other factors of your music and write this to the song tags without you having to do anything. So, before you spend 60$ on MIK I suggest checking out Rapid Evolution which actually sports a wide range of features beyond MIK (it is like an iTunes for DJs). Thanks for this dude. Good work. Stoked to use mik for my Glitch Hop mixes and mashups. Definatley seems quite useful and takes the tedious task of keying up your library w/ piano. Gonna try rapid evol. first just cause of money at the moment. @ollie – Have you upgraded to Mixed in Key 5 yet? Its much more accurate!